In the last two decades, legal English has attracted increasing interest and awareness, especially because English is predominantly the language of international legal practice. Nowadays English is widely used in a variety of situations including the legal profession covering law-making processes, legal service, legal textbooks, law reports, Acts, etc. This course book addresses to law students who wish to develop and improve their knowledge of legal English vocabulary to assist their legal studies, thus providing the necessary tools to operate with confidence in a business-law environment. The book also uses a grammar-based approach integrated with communicative methods providing self-study exercises, ranging from short gap-filling exercises to more involved comprehension ones. How does this course achieve these aims? 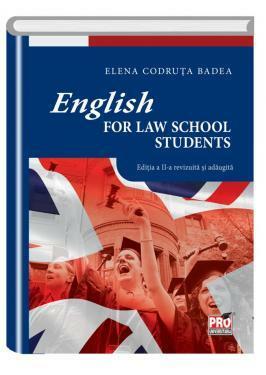 The book consists of seven thematic sections namely: A Career in Law, Criminal Law, Tort Law, Commercial Law, Intellectual property and Employment Law which several grammar issues such as: Each unit presents legal concepts in contexts and the topic –based activities are designed to acquaint students with the vocabulary related to each theme. It starts with an introductory discussion aimed to get students thinking and talking about the topic drawing attention to specific terminology and concepts. There are also activities which exploit the grammar and vocabulary and other activities aimed to encourage and develop students’ participation and acquisition. Each unit also deals with important grammar topics including an explanation of grammar structures along with contextualized practice exercises. It enables students to learn and practice English grammar in context. There are five grammar tests so learners can identify by themselves those areas which need improvement. Over to you activities are designed for oral debates or writing tasks about the legal jurisdiction students work or study in. The book combines different teaching activities such as pair or group work to get students involved in discussing, comparing and reading different texts. They can work alone preparing ideas or making notes before a debate, doing a brief written task, or doing grammar or vocabulary exercises. Discussions and sharing ideas encourage students to give opinions and enlarge certain topics, information gap activities stimulate individual participation. Problem solving assignments also stimulate meaningful communication, especially if students work together to solve them. Grammar and vocabulary exercises provoke lively conversations. The teaching strategies pay great attention to active learning which is stimulated by solving exercises or other written tasks.